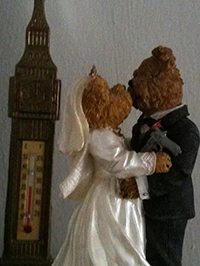 Groom wrote about his favorite Groom art, which included Sharla’s revisioning of I Am Legend. But since I just saw Guardians of the Galaxy last weekend, I had to interpret it differently. At first I was going to use the Groot character in place of Will Smith, but I didn’t want to steal any of Sharla’s thunder by using the same poster. 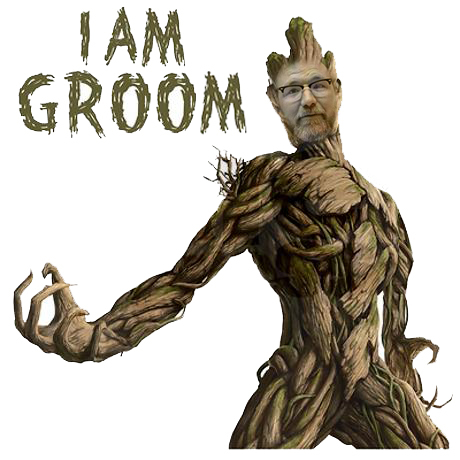 My next thought was to apply Groom to one of the Groots floating around online. Or I could take it back to the beginning with the original Groot. What I should do is find a way to animate it, but that seems like it will take work. With the first image, I payed with the layer blending mode until I found one that brought in some of the color from the background layer. The image has a grayish cast anyway, so it fits pretty well. The second image came in the Index color mode rather than RGB, so when I pasted Jim’s face on it, it didn’t make a new layer – apparently Index color doesn’t work that way. Luckily the grays match, more or less. I changed it to RGB then, and did a lot of copying and pasting to change a couple Ts to Ms and to get the punctuation in the right spots. I had to look for a custom font for the big name below the title. 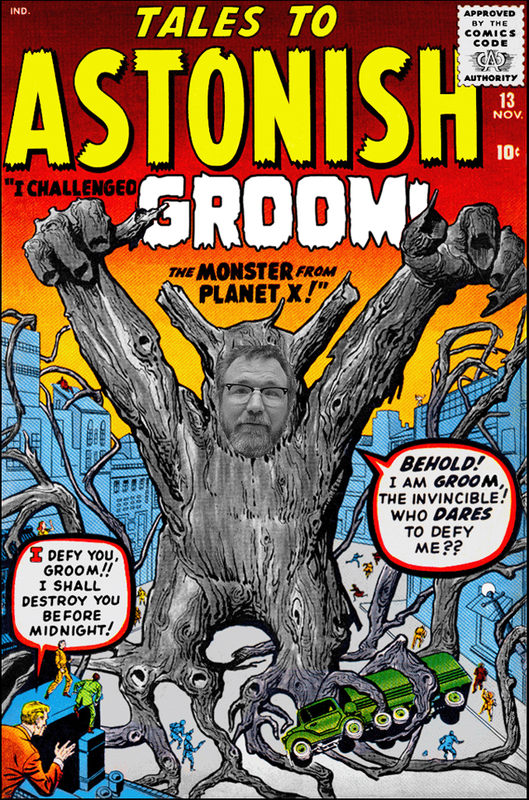 I scrolled through Dafont until I found Marsh Thing Regular, and I used their generator to make the name, then took a screen shot and brought that into Photoshop. I changed the letters from black to white and applied a 4 point stroke, in black, to them to get the outline. I had to copy and paste parts of the hands to bring them in front of the letters. It was kinda a lot of work, but Groot is worth it. This entry was posted in Uncategorized and tagged ds106, noir106, VisualAssignments, VisualAssignments353. Bookmark the permalink. lolx! I hope the professor is ok with this :). I really like the way you put the faces in this. The pictures are awesome! keep up the good work. Loving the work here! I know Groom probably got a kick out of this too.